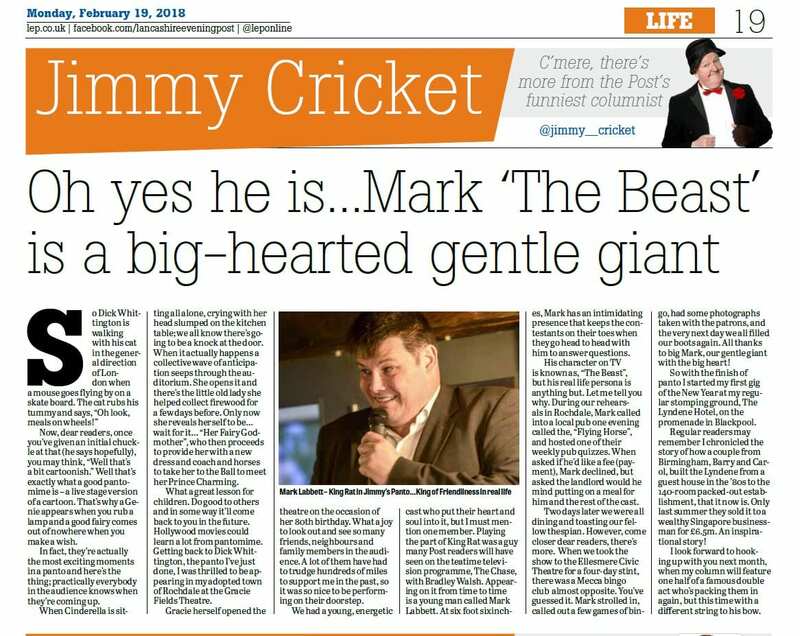 Jimmy Cricket’s latest column in the Lancashire Evening Post was about Mark ‘The Beast’ Labbett from TV’s The Chase. Famous Northern Irish entertainer Jimmy performed with Mark in pantomime in Ellesmere Port and Rochdale during the last festive season. Mark is a ‘Chaser’ on the ITV teatime game show The Chase, which is hosted by Bradley Walsh. He began the role in 2009 and he has since appeared on the American version as their sole Chaser in 2013 as well as being one of six Chasers in the Australian series. He has also appeared in several other television quiz shows and is a regular in quizzing competitions. His TV nickname ‘The Beast’ is a reference to both his stature (he’s 6ft 6in tall) and his surname – Labbett sounds like the French ‘la bête’, meaning ‘the beast’. In his February LEP column, Jimmy told how during the time the panto was in Rochdale, Mark hosted a weekly quiz in The Flying Horse Hotel in the town and then in Ellesmere Port, ended up calling out a few games of bingo at a nearby Mecca hall! On both occasions, Mark declined a fee and instead arranged for himself and the cast to have a meal courtesy of the two venues. Added Jimmy: “All thanks to big Mark, our gentle giant with the big heart!”.